Climate changes are an incinerator for natural disasters. 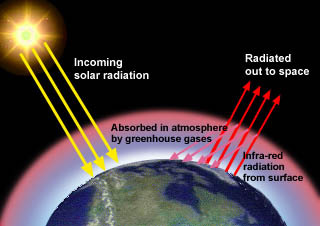 Global warming is induced by the release of greenhouse gases into the atmosphere by industry and transport. The Kyoto Protocol, aimed at reducing the production of greenhouse gases, also contributes to the long-term prevention of natural disasters. The UNFCCC United Nations Framework Convention on Climate Change was established during the Earth Summit in Rio in 1992. The convention consists of a treaty and an organization and has the goal to combat global warming by “stabilizing the concentration of greenhouse gas in the atmosphere on such a level, that a dangerous anthropogenic interference with the climate system will be prevented”. The Kyoto protocol is its amendment in which countries make commitments to which they are legally bound. With the added ratification of Iceland and Russia the protocol entered into force on the 16th of Feb. 2005. The 38 leading industrialized countries have committed themselves to reducing their collective emissions of greenhouse gases by 5,2% compared to 1990 until the period of 2008-2012. Countries have committed to national targets by fixed percentage, ranging from 8% reduction (EU) to a limited increase of e.g. 10% (Iceland). The industrialized nations accept the responsibility for being the biggest greenhouse gas producers and introducing changing policies, while developing countries have been admitted to prioritize economic development. Countries are provided with different options to fulfill the demands of the protocol through flexibility mechanisms: they can engage in emissions trading, or invest in Clean Development mechanisms (CDMs). The concept of Clean Development Mechanisms means that industrialized countries can gain credits by investing in emission reducing projects in developing countries. Joint implementation means the cooperation of industrialized countries. Reforestation programmes counting as carbon dioxide sinks can also be accredited. A compliance control system is also being installed. The weaknesses of the protocol are that the world’s greatest pollutants haven’t ratified the Protocol. Every source of CO2 production from energy production to industry, farming, waste management and traffic is included, except aircraft, while this is one of the strongest pollutants. TTM Technologie Transfer Marburg e.V.